The interior decorations are an eclectic mix of vintage furniture pieces, custom decorative pillows, and original art to complete a cozy, eye pleasing and relaxing space for people and dogs. Your stay with us also includes total access to all the amenities our property has to offer. This includes a large hot tub, heated seasonal swimming pool, barbeque grills at the clubhouse, and well equipped exercise center. There is also a large grassy play-field perfect for the kids, a basketball court, putting green, horseshoe pits, and playground for the little ones. Sports equipment is available for checkout at our front desk. Soak up the sunshine and relax on one of the many park benches and watch the activities. No worries, its time to have fun at the beach! Our wish is that you can enjoy this serene retreat and make lasting memories having fun at the beach. 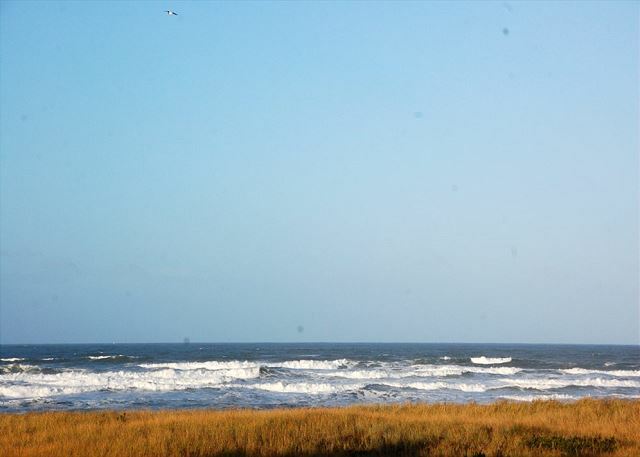 Our rental unit features a large picture window and balcony with a gorgeous view of the ocean. The unit was clean and tastefully decorated with everything from a telescope for watching surfers, to a comfortable reclining sofa. Plenty of games and movies to keep everyone occupied even on a chilly night.The best part was the pet friendly amenities. Our lab beagle mix was super comfy!Fun for the entire family. Beautiful unit! Loved the library shelves, the decor was beach themed done tastefully. Fantastic use of grays and blues. Furniture was comfortable, beds were great! Management company was so professional and friendly. And the view!!! Wow, wow, wow! These are generously sized units, but still feel cozy. Great place to get away. Highly recommend this unit. This was the second time that we rented #234. The condo is GREAT !! Always clean as a whistle and very quiet. Really enjoyed this visit and will definitely book again. Condo 234 - beautiful get away! 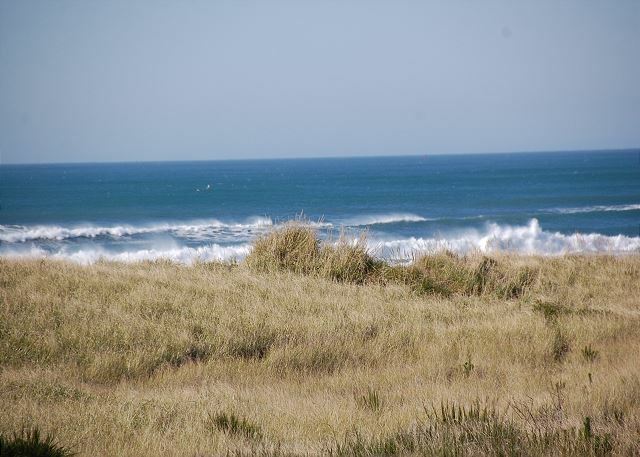 Great time of year to walk on beach, go deep sea fishing, stop at Wesport Winery! What a wonderful place to spend with our family to be together, walk the beach, enjoy the view and have a time for rest and relaxation. Absolutely loved the condo and its decor, cleanliness, amenities, and of course the view! We wish we could have stayed longer! Will definitely come back to this exact condo for a longer period of time. Thank you! Rented unit 234. Beautiful, comfortable, clean space and the owners really thought of a their guests. Along with food, you need to bring items like cooking spray, coffee, S&P and condiments but otherwise all set. Kitchen stocked with pans and dishes made it easy. CAUTION if you have young ones: not all windows have screens. Cable a available for the late night splurge. View is spectacular from living room, kitchen and deck! Disappointing paths to beach were closed except for one so it was a little inconvenient to get to the beach. Close to pool. What a great experience to have had a chance to stay in this place. I love the fact that our little dog had a great time too. I appreciate the details that the owners put in to this condo. Everything you need is practically there. We plan to reserving this unit again, hopefully soon. Thank you very much. We were looking for a pet friendly unit in Westport, close to the beach. What we got was a beautiful, excellently appointed, luxury condo that had just as many luxuries for our dog as us. The fantastic view was icing on the cake! The condo was everything it said it was. Our experience was great and we are already planning future stays. We were very happy. Wow!we loved everything about our condo and the views.customer service from the property manager was great. We had another wonderful stay with my mother for the Thanksgiving weekend. The staff was very helpful with our last minute reservation and getting us all set up for Thanksgiving dinner. This was our first time in #234, but the unit was just as comfortable and enjoyable as the others we have stayed in over the years. We will definitely be back to VBTS for a relaxing beach getaway. Thank you for sharing your gorgeous home with us! Your beautiful home is styled and furnished perfectly for a cozy beach getaway! And the view! The view is spectacular just amazing! Btw the king size bed was soo comfortable I didn't want to get up & we got a great nights sleep. Things we loved about the condo. What we liked best was that it was so peaceful. Because it's on the top floor, if you sit on the sofa in the living room or work at the counter in the kitchen you look down onto a beautiful view of the beach and the ocean. The unit was very quiet. Usually, the only sound we heard was from waves breaking on the beach. We enjoyed looking through a library of novels housed next to a clever painting with a quote by Melville about needing to be by the sea. The unit has interesting pieces of art and also furniture made out of repurposed objects - the library sits on a wooden ladder made into a bookcase. Bed headboards are made from refinished doors. There are interesting creative touches throughout, a flock of birds stenciled on one wall, a blackboard to leave messages, an abstract painting of a beach. The furnishings were clearly chosen with great care. The unit had everything we needed - TV, internet, kitchen appliances, cookware and dishes, a kite, and beach chairs in the closet, and even a supply of board games and dvds. The bed was large and comfortable. Everything was peaceful, clean and easy. Also, the grounds were very nice - clubhouse with a big library, exercise room, pool. We particularly loved the jacuzzi after a day of hiking in the Olympics. We enjoyed this rental and the experience. Great communication by the management and we had basically everything we needed provided in the condo. The condo was well maintained and very clean. The view is absolutely beautiful and the location is excellent. One recommendation is to have a firmer King bed, but that is just a preference thing, otherwise this was an outstanding experience and we would come back again. Wonderful to hear you had a great stay and we're happy to pass along the owners agreed with your recommendation of a firmer mattress and are putting in a new king mattress on 9/6/17. When you come back again to 234 please let us know how you like the change! We greatly enjoyed our stay here. The condo is incredibly cute, has a beautiful view, and very kid & pet friendly. No breakable looking decorations or glass tables to make us parents anxious. The people at Vacations by the Sea were very gracious and helpful. Overall, a wonderful stay at the beach.